Almost a week later and I am still buzzing from my whirlwind trip to Vienna for International Translation Day. UNIVERSITAS Austria had been kind enough to invite me along to a screening of „Vor der Morgenröte“, with a view to sharing my experience of playing an interpreter in one of the scenes. The film is set in the late 1930s/early 1940s and charts the later years in the life of Austrian writer Stefan Zweig who, being Jewish, in 1934 emigrated first to England and then to the US and Brazil. This was an invitation I accepted in a heartbeat, because let’s face it: what better place to mark such a special day than in multicultural Vienna, with its close proximity to the Czech Republic, Slovakia and Hungary – to name only some of the city‘s most immediate neighbours. Plus, it sounded exciting and even mildly glamorous! Which it was. Amidst plenty of extremely lovely colleagues, delicious sparkling wine and moreish canapés and popcorn, I had many an excellent conversation. One of the most frequent things people wanted to know was how long it took to shoot the scene (answer: a whole day for a 5-minute scene), and how come the director decided to use interpreters instead of actors (answer: because interpreters just have that certain je ne sais quoi…). What made the evening even more special was meeting some actual superstars of the translation and interpreting world: Dagmar and Judy Jenner of Twin Translations, well-known in our industry not only because of their high profile on social media, but also through their book The Entrepreneurial Linguist. The big-screen theme continued the next day, when I went along to a CPD event organised by UNIVERSITAS. One of the workshops was all about translating for the film industry, and it was fascinating to hear two translators‘ first-hand account of the challenges that come with providing translation services all through the making of a three-part historic film series. The film cast consisted of both French- and German-speaking actors who would all speak their lines in their respective mother tongues – which means our translators had to come up with bilingual scripts and all sorts of other creative solutions! For the final on-screen product, the French parts were then dubbed into German. This really was an extraordinary behind-the-scenes glimpse of what makes our profession so uniquely challenging and rewarding. Switching from business into tourist mode, I then spent a few days exploring. No trip to Vienna would be complete without a visit to the Hundertwasser House, designed by the infamous Austrian artist and architect Friedensreich Hundertwasser in the 1980s, originally as part of Vienna’s social housing scheme. (Yes, you heard that right.) 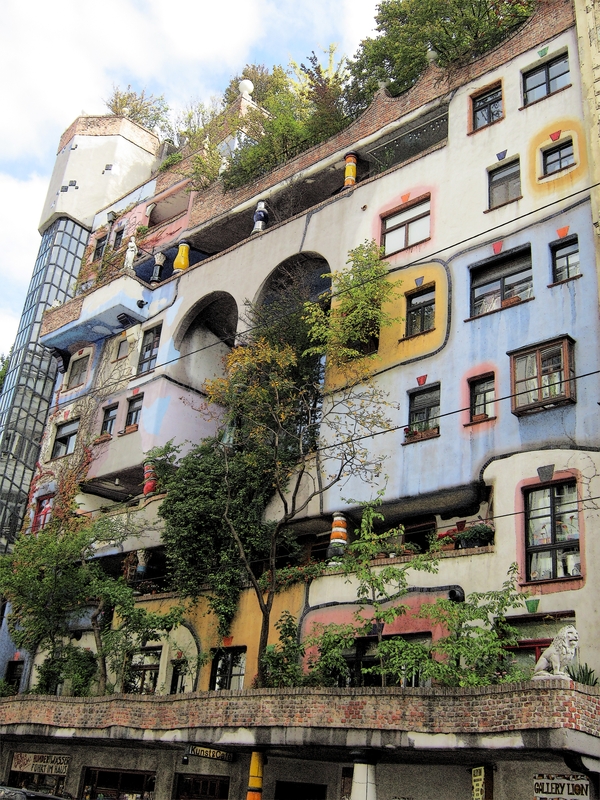 As someone who takes an interest in sustainable systems and permaculture design, I was awed by Hundertwasser’s concept of ‘radical architecture’ which incorporates nature and nature principles while leaving space for people to creatively shape their living spaces. 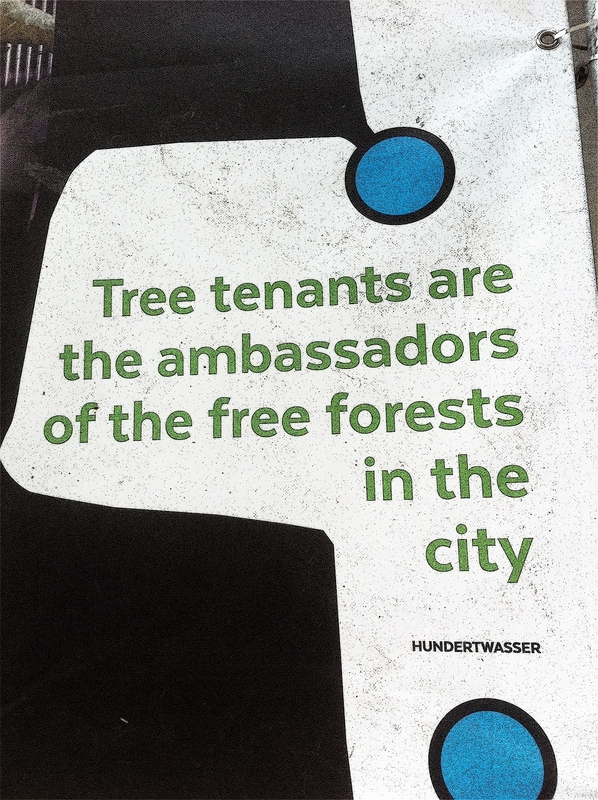 I certainly wouldn’t mind a few trees on MY rooftop! Did you know? International Translation Day is coming up on September 30th. I feel honoured to be celebrating this special day with colleagues from UNIVERSITAS Austria, who have invited me along to a weekend of networking and CPD events. They will be showing the film Vor der Morgenröte (“Before Dawn”), in which I make a brief appearance as an interpreter. I am excited about talking to other translators and interpreters about this unique and fun experience! Frohen Tag des Übersetzens! Here for love – not for money. In work – and precariously renting. yet waiting weeks to be seen by my GP. I have a stake in this, but no voice. it’s your life, so it should be your choice. than that which divides us. More than an empty phrase. It’s up to us to fill it with life. Whilst in real life, international jet-set interpreting jobs have pretty much been sacrificed at the altar of trying to minimise my carbon footprint, at least I can say that the world of Hollywood is still clamouring for my skills! And when I say Hollywood, I mean Berlin. Exciting. Way too exciting. I need a lie-down. Come back for the big reveal next week.